What is placer gold and how is it mined? Placer gold comes from alluvial or sand deposits in modern or ancient stream beds or glacial deposits. The gold has been moved by steam flow from its original source or vein. 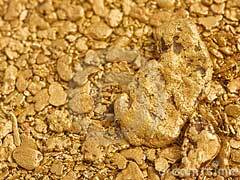 Gold is a heavy metal and tends to accumulate at the base of placer deposits. Placer gold mining includes many different techniques but the basic premise is to separate the precious metal from gravel or sand deposits. This is generally known as hydraulic mining or sluicing when commercially mined, or individuals can recover gold through panning, the rocker and the sluice. – Panning is a very slow form of gold prospecting and involves washing gold from placer or gravel. It is inexpensive and completely mobile. Panning separates heavy metals from sands. When traveling through gold country, you will find that souvenir shops allow their guests to pan for placer gold. – The rocker is a device used by small scale miners. The rocker is part of gold mining supplies that can be found in mining shops and includes “washing” stream bed materials to separate the gold from the gravel. What is placer gold and how do rockers fit in? Basically modern day rocker mining for placer gold is used for sampling. – A sluice form of gold mining is used by making a channel through water and controlling the amount of water. The sluiceboxes collect gold by riffles, corrugations, and mats. Mats and screens trap the heavier particles of gold and allow the waste gravels and sands to fall to the bottom. Miners have questioned what is placer gold and began using panning rocker and sluicing to find gold nuggets. Today’s placer mining methods in Alaska gold mines for individuals include mechanized sluice boxes that use electricity and high grade mats to retrieve the gold from gravels. Panning is also high tech with gold pans that claim to recover fifty times more gold than with conventional panning methods. Mine for placer gold with a variable speed gold pan and adjust it for maximum gold recovery. What is placer gold mining in the content of pan mining? Basically you will placer mine for gold in claims filed with the Alaska Bureau of Natural Resources and you will sign as a commercial concern or a hobbyist. As a general note of interest, California gold mines began with placer gold mining with panning, rocking and sluicing as the major form of finding gold. Today you will find that miners use sluicing as a way to sample gold in streams and river beds.